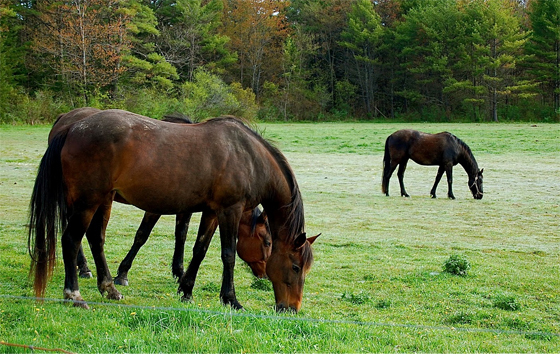 There are few campuses where students are not only encouraged to bring their own horses; they actually become indispensable study aids. This unusual addition to ‘school supplies’ is less surprising at SUNY Cobleskill, situated some 50 miles east of Albany, New York, and located in what Jeri Usatch loves to describe as the ‘Middle of God’s Country.’ As one of just six remaining state agriculture and technology colleges, the campus sprawls over 782 idyllic acres and is a place where the lecture hall is just as likely to be a stable, barn or kitchen. Despite the bucolic setting, as manager of the SUNY Cobleskill bookstore, Usatch has a strong business reason to be at Cobleskill, and there’s certainly no lack of work to do. But some of the most meaningful initiatives Usatch has put into place since her arrival have been more than just good storekeeping. “Rural communities are famous for their hospitality and I really wanted to develop some great relationships here,” she says. Enlisting the help of the college culinary club, Usatch created a regular meet-and-greet lunch program with the Cobleskill faculty. “The lunch was initially designed as an ice-breaker, but it has since developed into an opportunity to talk more openly with the faculty and involve everyone in what is going on with the store,” she says. Since the meetings began, visitors have dropped by more frequently, invitations are extended to join board meetings and events, and Usatch has learned more about her students’ needs – responding to everything from the graphics or color choice of clothing, to the latest trend in popular snacks. 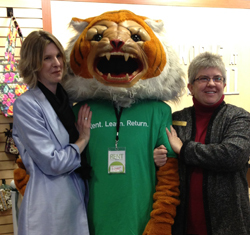 SUNY Cobleskill Bookstore Manager Jeri Usatch (left) poses with the school’s mascot and Barnes & Noble College Regional Manager Debbie Parker.